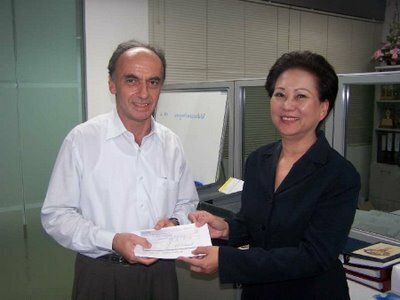 Mr. Roger Butterworth, Research Consultant of Tisco Securities Company Limited, presented his cheque to Khun Pattira Wattanawarangkul, Manager, for donation to Tisco Foundation on occasion of his birthday. 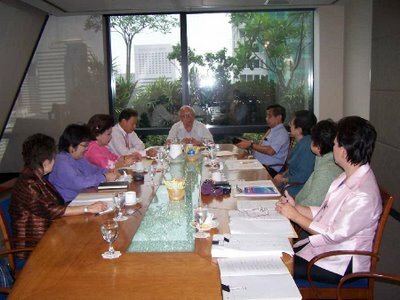 Picture taken with Tisco Foundation Chairman and Directors, teachers, and scholarship students. 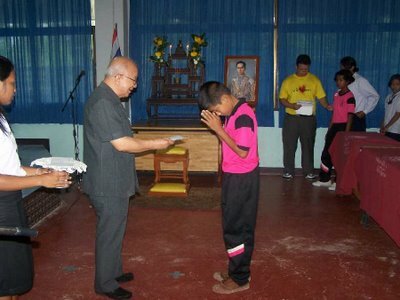 Mr. Kamchorn Sathirakul, Chairman of TISCO Foundation, presented scholarship fund to 131 needy students at Pakpanang School, Nakornsrithamrat, on May 19, 2006. Khun Dusadee Rattanapapaschala Social Worker of TISCO Foundation visited Khun Lamduan Saleephan who received start-up fund recently. 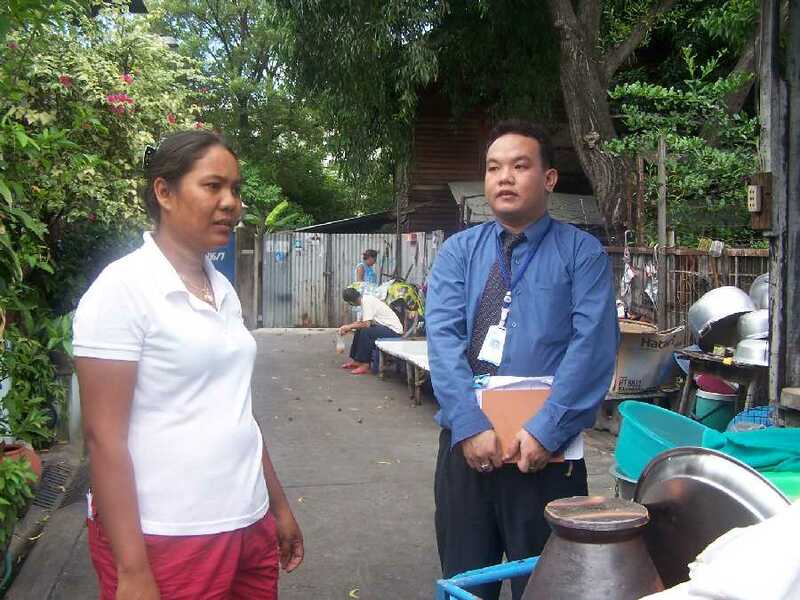 She is seen selling nam taow hoo (Soi bean milk) and bread to her customer. She made about Baht 100 perday in prefit. มูลนิธิทิสโก้เพื่อการกุศล ไปติดตามผลผู้ได้รับทุนขายน้ำเต้าหู้และขนมปังปิ้งทาเนย (นางลำดวน สาลีพันธุ์) ที่เขตลาดกระบัง ได้พบว่าผู้ขอทุนกำลังขายของอยู่บริเวณทางเข้าหมู่บ้าน และได้รับแจ้งว่ามีกำไรจากการขาย 100 บาท ต่อวัน โดยขายตั้งแต่เวลา 06.00 - 10.00น.